If there has been a breakout story in the SHL this season it is the rise of young defenceman Rasmus Dahlin. Dahlin turned 17 last week, ending his run as the best 16-year-old hockey player in the world and starting his year as the best 17-year-old. Even if Dahlin stands tall when being interviewed, everyone keeps saying that he needs to grow his stature and frame. With five points (3G, 2A) in 14 playoff games with Frölunda, what stood out this year was the time in the World Junior Hockey Championship that put everyone’s eyes on the Swedish talent. He became the youngest Swedush player ever to suit up for the WJC. Coach Rönnberg is in the same boat as Mr. Johansson, and the Frölunda spirit shows through. He knows his role and his vision is clear. ”We are here to educate players. That means I want to support them in the things they do. Of course, if things happen at the wrong moments or a few too many times, then I step on the brakes. But if he wants to deke someone in the offensive zone then he has to do that, and it is up to an attacker to cover Dahlin’s “normal” position. “It’s a team effort and the upside that a player such as Dahlin brings, you have to use it.” It is a balancing act especially during the playoffs, but as Mr. Johansson says, so far it has worked out on the plus side for Dahlin. To speed up and further the education, the day after a game is usually spent with the master and student watching every shift played on video going over strengths and weaknesses during the previous match. When Dahlin steps off the ice after practice, the first thing that hits me is how tall he is, already standing 6’1” without skates. It’s the day after Game Five in the best-of-seven semifinal against Brynäs, a game Frölunda won. Brynäs eventually took the series in seven games, and is currently playing in the final against HV71. Dahlin has made an impact and the previous night he scored another goal. When asked about what has changed for him during the playoffs, he answers without hesitation. “I have gained confidence throughout the playoffs, and I have matured a lot. The physique will have to wait until summer, hence right now it is the development of my game that has changed the most. One thing that has surprised a lot of people around hockey in Sweden is how well the 165-pound defender has adjusted to playoff hockey, which is usually a fair bit more physical than the grind of league play. Dahlin had three points (1G, 2A) in 26 games and has already surpassed that in game 11 of the playoffs. It is his physical play that has surprised many. Speaking about the upcoming summer Dahlin offers up his thoughts and this own explanation to why he isn’t as big as he could be. “I have practised hard all summer before, but I hadn’t really entered puberty so I haven’t been able to build up muscle the way that I have needed. It will be important this summer to build up my muscle mass a bit. When it comes to the NHL team that drafts Rasmus Dahlin, you have to remember that he will never be a bruising type of player. He isn’t the big, stable defender. Dahlin’s upside lies in his offensive play and any team that selects him would do well to use Frölunda’s way of thinking: as long as he is generating more goals than he causes due to his sometimes naïve play, the team will benefit from his presence. It will be interesting to see his next steps in Frölunda and the SHL next season, because it will undoubtedly be the last spent in Europe for a long time. The next step has already been achieved. When Frölunda got knocked out of the playoffs, Dahlin wasn’t called in to join his fellow teenagers for the Under-18 World Championship; he was called up for the friendly games for the National Men’s Team against Belarus. For the young phemon, you have to believe that his experience on the international stage is just beginning. In 2007 Edmonton drafted Alex Plante in the first round, so playing international hockey isn’t a surprise. Just that his debut came 10 years later – with Korea. The two-metre (6′7″) defenceman is not your typical Asia League player. Korea’s answer to Zdeno Chara stands out in size and he’s one of few players in league history with NHL experience even though he didn’t have his breakthrough in the NHL playing 10 games for the Edmonton Oilers in his four years in the organization. After not getting the chance in the big league, he took in 2013 the path his father Cam had taken about 30 years earlier and moved from the AHL to Austria. After one season with Dornbirner EC he moved to Norway where he played one season with his brother, goalie Tyler Plante, for Lorenskog. Then he suddenly landed at Anyang Halla, Korea’s top club team in the Asia League, where he completed his second season and won the title earlier this month. “I just signed a two-year deal with Anyang Halla. We’ve had a couple of good years there, we won the [Asia League] championship, the organization has been great, we absolutely love it,” Plante said about his experience. Korea has made a name for itself in recent years for naturalizing players from its Asia League clubs and Plante is the newest addition. He missed the 2017 Asian Winter Games but got Korean citizenship one month ago and fulfilled the eligibility criteria after two seasons in Korea. With goaltender Matt Dalton – arguably the most important addition last year – defencemen Plante, Eric Regan and Bryan Young as well as forward Michael Swift the Koreans have five Canada-born players on the roster. And that line-up doesn’t include forwards Brock Radunske and American-born Mike Testwuide, who missed out on the tournament this year due to injury. Add to that NHL experience behind the bench with Jim Paek and Richard Park, who were born in Korea but grew up and played in the United States and one can easily see that the ambitions are high one year before Korea hosts the 2018 Olympic Winter Games. One word he learned is chamchi gimbap, which he calls his favourite Korean food. “It’s a little roll that has tuna, and, I can’t name all the stuff that’s inside, it looks like a reversed sushi. It’s traditional snack food in Korea but I can’t get enough of it,” he said. Knowing about the Koreans’ desire to have him join the national team, he already played exhibition games with them before actually getting his passport. “I’ve done it all year now with the Euro Ice Hockey Challenge and stuff like that. I look at this like I’m thankful to have this opportunity. It was a bit different in the beginning but I’ve been in Korea for two years, it’s been a great family for myself, my kids and my wife,” he said. “The tournament gets harder and harder. Every game is a championship game. Our players work extremely hard. They’re a dream to the coach because they listened to the coach. I have to give all the credit to them. They try to get better all the time,” the coach added. Korea improved over the last few years. Thanks but not only because of its imports because other players got better too. The first two offensive lines are made of native Koreans including Sanghoon Shin and Kisung Kim, the scoring leader and the top goal scorer of the Asia League playoffs respectively. Although the team just ended up in fifth place in last year’s IIHF Ice Hockey World Championship Division I Group A in Katowice with tight standings, it was in contention for promotion until the very last day when losing the spot in the top division to Italy after a 2-1 loss against the Azzurri. This year the team started well with two wins including the first-ever victory of Korea against Kazakhstan. “It’s my first Worlds, I didn’t know that we wrote history. I’m just happy to be part of it. We just keep finding ways to get the bounces and to get them in. We’re going to enjoy this for a couple of minutes and then get ready for the next one. It’s a short tournament and we have to move on,” he said after scoring two goals in the victory against Kazakhstan. The word promotion wasn’t heard that often but the slogan hanging in front of the locker room is “Make Korea proud”. The next period comes soon. After beating one of the two teams that came down from the top division, they will play the next one today, Hungary, at 17:00 local time (16:00 in Hungary, 23:00 in Korea). The current road clearly goes to PyeongChang 2018 where Korea wants to be competitive against nations that are even higher ranked than the ones here. They’re seeded in a group with defending champion Canada, the Czech Republic and Switzerland. “It’s our big goal but we’re looking now where we are at. It’s in the back of our mind. This tournament here is a step to competing at the Olympics,” he said. 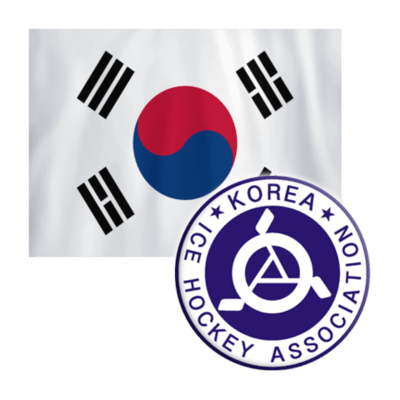 And if Korea continues to play well here in Kyiv, they may play at the top level next year not only as the host at the Olympics but also as one of the teams promoted to the 2018 IIHF Ice Hockey World Championship in Denmark.